Noted orthopaedic trauma surgeon Philip Kregor was blunt when he met with jockey Kendrick Carmouche and his wife, Whitney, following a horrific accident at Kentucky Downs last Sept. 8. According to Whitney, he told them Carmouche's broken right femur was one of the two worst he had ever seen and compared the damage to what might have occurred during an explosion. He warned that there was a five percent chance the leg would not fully heal. “He said it was about as traumatic as a leg break can be,” Whitney recalled. More than four hours of surgery to repair the widespread damage and insert a metal rod, two long nails toward the hip and two smaller screws near the knee were followed by arduous physical therapy until the end of Carmouche's ordeal is finally in sight. He has begun galloping horses in New York with an eye toward a March 1 comeback at Aqueduct Racetrack. That optimism sustained him as he dealt with a range of emotions. Anger still surfaces as he recalls what he describes as the “uncalled for” actions of jockey Adam Beschizza, who was suspended three days for careless riding. 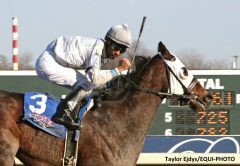 Beschizza's Sovereign Impact, struck left-handed, moved into the path of Chattel, Carmouche's mount, in the Kentucky Downs Juvenile Turf Sprint Stakes, forcing them to clip heels. Chattel fractured a shoulder and had to be euthanized. Carmouche's anger quickly subsided, though, as he went on to say that Beschizza visited him at Nashville's TriStar Skyline Medical Center as soon as possible to offer an apology that was accepted. Carmouche stands out in ways beyond being one of the few African-American riders to achieve prominence in this era. He won the riding title at Parx Racing in Bensalem, Pa., every year from 2008-'11 and again in 2013. He was more than holding his own on the rugged New York circuit last year. According to Equibase, horses ridden by Carmouche averaged a career-high $9,207 per start in winning at a 15 percent clip (104 of 718) for purse money of $6,454,195 before his season abruptly ended. Even as Carmouche began his long road back, he worried about his agent, Kevin Bubser, and suggested clients Bubser might pursue in his absence. Bubser said he never found the right fit and opted to remain on the sidelines for the first four months before he took on Kevin Carmona, an apprentice at Parx, on Dec. 1. Bubser is now working on behalf of both riders. Carmouche and Whitney live in Delaware. They have two children, Olivia, 12, and Kendrick, 9. Whitney said many jockeys decide against taking disability insurance due to high premiums. She will be forever grateful that they paid $9,500 annually for many years for a policy that took effect after three months. Carmouche's recovery was particularly agonizing because he declined to take painkillers after the first five days. He did not want to take any chance that he might become addicted. Without painkillers, Carmouche found it nearly impossible to sleep at night as muscles in his leg and buttocks that had atrophied slowly returned to life. His right knee became swollen and painful because of the stress it was bearing during therapy. “The last two months, I've been sleeping like a baby,” Carmouche said. He has been walking without crutches since Christmas. What had been a noticeable limp is gone. Carmouche was born into racing in Lake Charles, La. His father, Sylvester, is a former jockey best known for a 1990 race at Delta Downs when he hid in a fog bank while the rest of the field raced around the track another lap and then emerged from the fog with a huge lead. 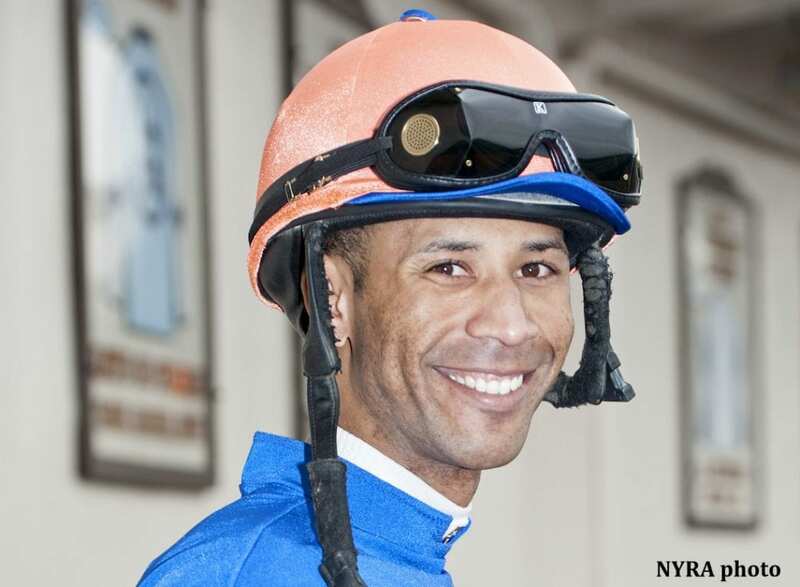 Carmouche began riding when he was 10 and was galloping horses by the time he was 12. He competed in his first race, at Delta Downs, when he was 16. Other than broken ribs, which healed in a month and a half, this was his first major injury. Carmouche will be forever grateful to Dr. Kregor, a driving force during his recovery. After surgery, he proved to the rider that the damage had been repaired by bending the badly-broken leg until it reached the patient's chest. He emphasized that the rest depended on Carmouche's will to recover. Dr. Kregor made three trips from Nashville to Delaware to check on the rider's progress and is due to check on him a final time. The next challenge for Carmouche – and it is a significant one — will be to rebuild his business. Although Carmouche must shake off rust that accumulated for half a year, he cannot wait to prove himself again with mounts capable of winning. This entry was posted in NL Article, Ray's Paddock and tagged adam beschizza, aqueduct, jockey injuries, Kendrick Carmouche, kentucky downs, kevin bubser, kevin carmona, New York Racing Association, Parx Racing, Philip Kregor, sylvester carmouche, whitney carmouche by Tom Pedulla. Bookmark the permalink.